A diagnosis of Dementia with Lewy Bodies should only be done by a qualified professional. However, a simple checklist for Lewy Body Dementia Diagnosis may help you advocate for a loved one more effectively. Afterward completing it, when you see your specialist, you can discuss the results of the test. Mentioning all the specific symptoms they exhibit that are known to commonly accompany the condition. Exceptional research by James E. Galvin, MD, MPH, led to his publishing of The Lewy Body Composite Risk Score (LBCRS) in Autumn 2015. 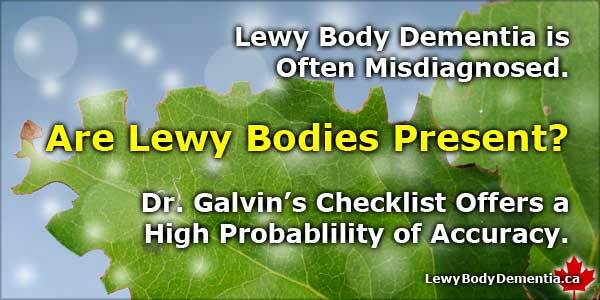 In it he has created a very simple, ten question test that has incredible accuracy in predicting the likelihood of the presence of Lewy Bodies. How many of the following have occurred at least three times over the past six months? 1. Slowness in initiating and maintaining movement or have frequent hesitations or pauses during movement? 2. Rigidity (with or without cogwheeling) on passive range of motion in any of the 4 extremities? 3. Loss of postural stability (balance) with or without frequent falls? 4. Tremor at rest in any of the 4 extremities or head? 5. Excessive daytime sleepiness and/or seem drowsy and lethargic when awake? 6. Episodes of illogical thinking or incoherent, random thoughts? 7. Frequent staring spells or periods of blank looks? 8. Visual hallucinations (see things not really there)? 9. Appear to act out his/her dreams (kick, punch, thrash, shout or scream)? 10. Have orthostatic hypotension or other signs of autonomic insufficiency? Total how many of the above 10 items occurred at least three times during the past six months. If the total is three or more, there is a very high likelihood of the presence of Lewy Bodies. Discuss the results with your medical specialist. James E. Galvin, M.D., M.P.H., is Professor of Neurology, Psychiatry and Population Health at the New York University School of Medicine and one of the most prominent neuroscientists in the country. In addition, Dr. Galvin is a professor of clinical biomedical science in Florida Atlantic University’s Charles E. Schmidt College of Medicine and is also a professor in FAU’s Christine E. Lynn College of Nursing. Sorry that is your experience, Sharon. That is unusual but I’ve seen drastic and almost instantaneous changes happen when an infection has developed: particularly a urinary tract or respiratory infection (such as Pneumonia). It is possible that this is not Lewy Body Dementia. Careful diagnosis is needed. Haldol is one of the most strongly recommended against, as are all traditional antipsychotics. So it’s good that despite its use he is not too negatively impacted. If it was me, I would still ask that Haldol and any traditional antipsychotics not be used again. Ask about alternatives that are commonly less catastrophic with LBD. These could include Seroquel/Quetiapine, among others. I hope he improves and stabilized and that your specialists can arrive at a successful treatment method. Haldol I believe killed my dad, along with all the drugs given after his back surgery. He was sent to hospice where he was basically put to sleep. I have been diagnosed with LBD last November. I was waiting for a hyperparathyroid operation and my consultant referred me to her collegue to check for parkinsons, as my memory and stability weren’t very good. However, once I had had my operation, everything thankfully went back to normal, including my balance. I had a Datscan and this apparently persuaded them that I had LBD, but I have no symptoms. I don’t see things that aren’t there, I don’t have any tremours, I am not confused and know where I am. My speech and language are fine too. I am afraid that I have been diagnosed as ill, when really I’m not. I know that a Datscan result isn’t all conclusive, so in the absence of any other symptoms, could I be okay after all? Sorry for the diagnosis, and for the medical confusion you’ve experienced, Alison. Very upsetting to get a diagnosis, doubly so to have confusion with it. Since you’ve reviewed Dr. Galvin’s checklist, and if you feel you don’t exhibit any of the key symptoms, I’d suggest you raise this with your specialists. A DAT-scan can be very illuminating, but with no hallmark symptoms, it certainly seems odd to have that diagnosis. > I hope you’re correct, and don’t have LBD, and that you can get this straightened out ASAP. My mom has had shaky hands for years. In the past few years she has had short term memory loss. After a fall, she was going in for surgery and the anesthesia caused high carbon dioxide levels. She had delirium for a few days. A month later she entered a rehab and she became delusional and outright violent. She was diagnosed with a Urinary Tract Infection (UTI). She has been better the last few weeks, her normal self — but my sister, after researching, thinks she has LBD. I think her beginning dementia was exagerrated by the anesthesia and UTI, but LBD?? Neurology appointment next week. I hope it is a good one — who can tell. The delusional mom was scary and sad. Can this come on so sudden? Hi Becky — sorry for how things have gone with your mom. It’s so very hard. I wouldn’t expect a certain diagnosis, primarily because dementias are most commonly mixed, despite common belief. Could be a mix of many things, not to mention the potential impact of some undiagnosed mental illness or medication problems. The latter is surprisingly common. Also, delirium can have lasting effects, but it is possible she has LBD, if the checklist on which page you’re commenting indicates it. It’d be worth printing and bringing with you to the neurology appointment. > For everyone’s sake, I hope it is not LBD. But if it is, an early diagnosis will avoid medication problems, and make the difficult journey the best it possibly can be. She’s lucky to have you and your sister on her side!